The incident caused chaos on other metro lines in the city centre as crowds of people were forced to change trains. Taxi drivers took full advantage of the situation and charged exorbitant rates to commuters. 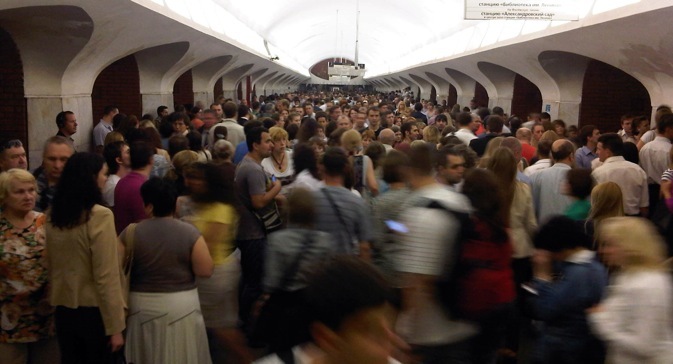 Downtown Moscow witnessed chaotic scenes as thousands of passengers had to be evacuated and dozens needed medical help after a fire broke out in metro during the morning rush-hour on Wednesday. RIA Novosti cited the Moscow emergencies service as saying that the fire broke out in a tunnel between Biblioteka Imeni Lenina and Okhotny Ryad, two stations on the Moscow Metro’s oldest Sokolnicheskaya line which runs through the city centre close to the Kremlin. Six stations on the line have been closed, the news agency said. The Russian Ministry of Emergency Situations said that 7 people, including a 6-year old child were hospitalised after inhaling dense smoke caused by the fire in the Moscow metro. Out of the 4,500 people evacuated from the underground, 45 needed medical treatment, the ministry said. Smoke was detected inside a train moving towards the Biblioteka Imeni Lenina station, a Moscow police department spokesman told the news agency. Electricity supplies were cut off to enable fire-fighters to enter the tunnel. Ambulance vehicles waited outside the stations in case of casualties. The incident caused chaos on other subway lines in the city centre as crowds of people were forced to change trains. The Park Kultury subway station was one of several which came to a standstill, with trains arriving unable to offload passengers due to the crowds trying to get in and out of the station. Thousands simply gave up, and started walking or taking buses and cabs, including an RIR reporter. A witness told RIR that taxi drivers in central Moscow were asking passengers to pay well above the standard fares for rides to short distances in the centre. Moscow has one of the largest and most efficient metro systems in the world, but transport experts have often warned of a lack of contingency plans to meet emergency situations.